Many of you who are picture books writers, already know about Tara Lazar‘s yearly writing challenge. 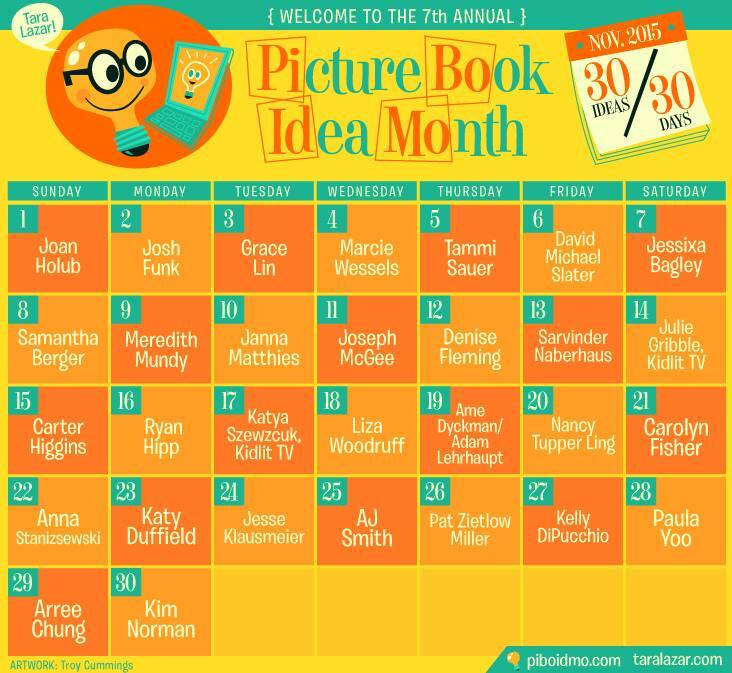 2015 is the 7th Annual Picture Book Idea Month, PiBoIdMo for those who don’t have time to say Picture Book Idea Month. Although no one really knows how to pronounce it (even Tara agrees there more than one way to say it), it’s one of the best online support groups you’ll ever join! Every day in the month of November, Tara features a guest speaker on her blog. These amazing and generous people share insights and funny anecdotes about writing for children. And even more amazing and generous, are the prizes offered almost daily. Once you are registered you may log on to Tara’s blog daily, read the article, and comment on each one. It’s that easy! Check out this year’s line-up…. Now, granted that part only takes 5 minutes of your day. The real work begins when you log-off. The whole point of this adventure is to be inspired, open your mind, and look in unlikely places for ideas for your next picture book. These can come when you least expect it: while driving, walking the dog, housecleaning, showering, or trying to go to sleep. Be prepared with a computer, notepad, post-it notes, or your phone nearby at all time. Record those little buggers before they slip away. The goal is to capture one new idea per day that you can work into a picture book. By the end of the month, you’ll have 30 ideas… hopefully loads more. Registration closes at the end of the first week of November, so you only have a few hours left to join the fun. So, jump in now… the water’s great!